Since I don’t eat much gluten OR dairy now, I figured I just wouldn’t have much pizza anymore and that was that. But for quite some time now I’ve been hearing about a cauliflower pizza crust. I’ve seen photos of it on Instagram and people posting how good it is on Facebook. But I never tried it. UNTIL NOW. Organic cauliflower was on sale and looked great, so I thought, why not? I gave it a go. The verdict? It’s super yummy! Very fragile, hard to handle and I needed to eat it with a knife and fork, but overall a winner! I’d love to know what you think and of course if you try it, please let me know! Mix the vegan egg and set aside for 5-10 minutes. Add the cauliflower to a large pot with enough water to cover, a few cups, and bring to a boil. Drain the liquid and transfer to a shallow bowl. Place in the freezer for 5-10 minutes, so you don’t burn yourself squeezing out excess water. Remove the cooled cauliflower and put in a cheesecloth, nut milk bag or thin dishtowel. Squeeze out all of the excess water. In a large bowl, mix together the cauliflower and all the other ingredients. 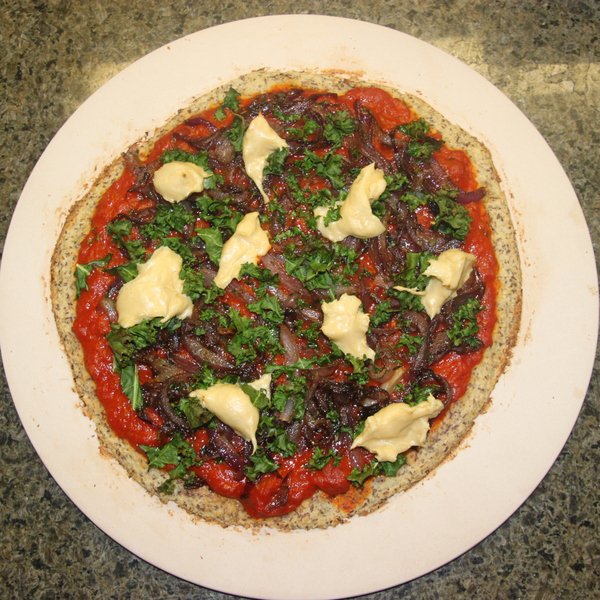 On a pizza stone (or baking pan), flatten out the mixture to make a crust about ¼“ thick. Bake for 30-40 minutes, until lightly golden and dry to the touch. Add sauce and your favorite pizza toppings and return to the oven another 5-10 minutes. 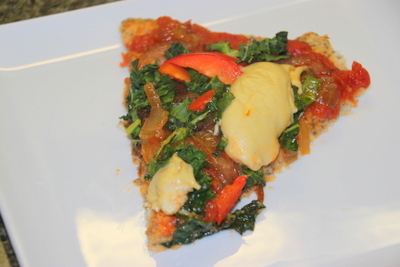 I added marinara sauce, sauteed onions, fresh kale and some vegan mozzarella cheese, recipe below.